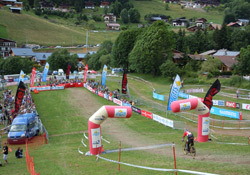 Les Gets has hosted numerous high profile MTB events in the past, such as the World Cup Competition and the 2004 World Championships. This last weekend saw the latest in the line, with the French National MTB Championships coming to town. 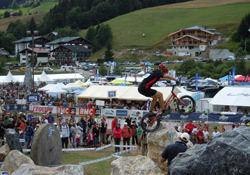 Les Gets was buzzing with biking activity, and the entourage which accompanied the various teams. The 3-day event was a great spectacle for biking enthusiasts and those just interested in watching some of the best in the business work their magic. The Downhill, Trial and X-Country trails had been prepared especially for the event, and the Perriers ski lift was in operation over the weekend to take spectators and Downhill competitors to the top. Even the Petit Train changed its route to take people to and from the event grounds. The paddock at the foot of the Perriers was turned into the bustling centre stage of the show, incorporating the winners podium, the finishing line of the Downhill run and the astonishing course for the Trials event. The speed and skill needed for the Downhill was truly impressive, but the Trials event was our favourite. Not knowing anything about the discipline, we were awe-struck to see grown men hop from the ground onto huge boulders, on their bikes and still keep their balance. Even now, we’re wondering what laws of physics they managed to bend in order to accomplish their task. It’s not something we’re considering taking up ourselves any time soon, but it certainly was great to watch! 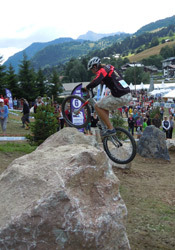 Les Gets’ program of mountain biking events is constantly evolving and remains a high priority for the resort, with a 10-year development plan in place (so says the Mayor). We’re already looking forward to the next big event!